Wikipedia defines digital transformation as “the change associated with the application of digital technology in all aspects of human society” and “that digital usages inherently enable new types of innovation and creativity.” Management consultants have been raking in big bucks helping established businesses plot digital transformation strategies to defend against “digital disruptors” poised to enter existing markets and win over customers. While this is a valuable exercise for C-level executives, CIOs and IT managers also need to adopt a pragmatic and more tactical approach to “going digital” that starts with acquiring the tools and building the new skills needed to ensure business success and profitability in the face of digital disruption. As the world becomes pervasively more digital, businesses actually have little control over the timing and phasing of the digital transformation process, which is equal parts proactive and reactive. While it is imperative to develop a plan, a realistic strategy must also factor in the inevitable disruption that will impact various aspects of the business, driven by external forces beyond management’s control. Whether management recognizes it or not, the majority of businesses are already being digitally transformed and forced to deal with the effects of digital disruption. Let’s look at some of the typical digital disruption challenges businesses are facing. Competitive forces have driven many companies to engage with customers online, not only selling products but also providing support and other services. What does a company do if its online operations happen to be hit by a DDoS attack? Will they even know they are under attack? Employees are increasingly mobile and working remotely over consumer-grade broadband and public WiFi connections. What happens when remote workers start complaining that “the network is slow”? Is it actually a network problem and if so, whose network? The majority of software vendors are embracing the SaaS model and moving their applications to the cloud, and have enticed enterprise customers with compelling pricing models. However, what steps do enterprise IT managers take to determine why a SaaS application has suddenly started performing poorly? What happens after they call the vendor who says that everything looks fine on its end? Many large businesses already have DevOps teams deploying new microservices-based applications in public cloud infrastructure. How are these teams able to monitor the performance of these cloud-based applications? How are they able to diagnose network problems that might span the cloud provider’s infrastructure, the public Internet, enterprise networks and service provider access networks? Streaming video is now widely used in business settings but video traffic typically traverses multiple paths from its source in the cloud across CDNs and the public Internet to the enterprise user’s device. How does IT operations manage video streaming to ensure end-user quality of experience? How will they be able to rapidly identify and fix performance problems? IoT is inherently digital and adoption is occurring at a rapid pace as businesses instrument the physical world with sensors spanning a wide range of environments. Yet industrial scale IoT applications require new tools for cloud-scale visibility in order to ensure performance and security in the face of unexpected digital disruption to the devices, the underlying networks or the supporting infrastructure. If the fuel for digital transformation is software and the engine is commodity hardware, then the public Internet serves as the power distribution grid. For more than two decades, large-scale data centers and private WANs have been the backbone of business operations. Now digital transformation is driving businesses to utilize public networks for much more than e-commerce applications. The Internet readily connects businesses with customers, partners and employees, anywhere in the world. It provides connectivity to public and private clouds for the delivery of both consumer and business applications and content. The deployment of IoT relies on the pervasive nature of Internet connectivity. One could argue that every facet of digital transformation ties back to the Internet. Yet due to its decentralized and distributed nature, the public Internet is particularly vulnerable to enabling and propagating the forces of digital disruption. 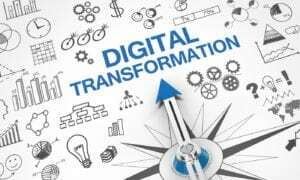 Successfully managing through these disruptions to realize the ultimate benefits of digital transformation requires new tools and techniques for ensuring the delivery of cloud-based applications and services. Too many businesses currently lack these tools because they have only been concerned with managing traditional private data centers and enterprise WANs.